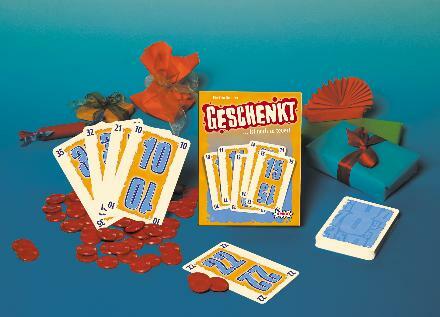 Geschenkt - ist noch zu teuer! Fast card play that is extremely easy to learn. Anyone can play, but the joy comes from forcing others to make choices they don't want, so it's best in a competitive group. This game is completely language independent, so there is no problem in getting the German version. It is a great little filler that works well if played by the same people several times in a row - it is almost certain to create a meta-game where you try to get back at someone for what they did to you earlier.